Scanning electron micrograph of the surface of a 10% HA/10% MgO PLLA composite after incubation in cell growth media at 37 °C for 7 days. Magnesium plays an important role in the body, maintaining bone health and mediating cell function, so it should come as no surprise that this biocompatible, biodegradable, low-cost, and environmentally friendly material also boosts the performance of artificial bone composites. Until now there has been little examination of the effects of Mg on tissue engineered replacement bone scaffolds. But Thomas J. Webster and his team at Northeastern University have found that simply adding MgO nanoparticles to polymer composite scaffolds helps bone-forming cells stick [Hickey et al., Acta Biomaterialia, http://dx.doi.org/10.1016/j.actbio.2014.12.004]. Biomaterial scaffolds that support the regeneration of damaged bone tissue using the patients’ own cells and then degrade to leave just the new tissue are increasingly in demand as existing implant materials are invasive to install and can lead to long-term health problems. 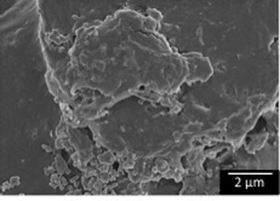 The new scaffold comprises 20 nm MgO nanoparticles mixed with the biodegradable polymer poly(L-lactic acid) (PLLA) and hydroxyapatite (HA) nanoparticles. Adding MgO increases the stiffness and elasticity of HA-PLLA composites to match more closely the properties of native cancellous bone – the spongy tissue found in the core of vertebrae and at the end of long bones like the thigh (or femur). While varying the size, shape, and concentration of the nanoparticles allows the mechanical properties of the scaffold to be finely tuned. But most significantly of all, the nanoparticles improve the adhesion and proliferation of bone-forming cells (or osteoblasts). In fact, osteoblasts adhered twice as well to scaffolds containing MgO as to plain PLLA samples. “At this point, we do not know the exact mechanisms that make this happen but we expect the MgO nanoparticles degrade to release Mg2+ ions, which are known to play a key role in the action of several cellular proteins and processes,” says Hickey. The degradation of the MgO nanoparticles appears to release products that improve the adhesion of osteoblasts, while the PLLA preserves the scaffold’s mechanical properties. The nanoparticles also appear to have an antibacterial affect and enhance the function of fibroblasts, the cells found in skin, tendons, and ligaments. In a two-year study, Austrian researchers have investigated the behaviour of magnesium-alloy implants in mammalian femurs. Smart bio-coatings for controlled degradation rates.